Smirnoff Red Label Vodka is a popular Vodka available from DrinkSupermarket.com in 50cl to buy online. Visit DrinkSupermarket.com for the best price for 50cl of Smirnoff Red Label Vodka or compare prices on our other Vodka products. Smirnoff Red label is the benchmark worldwide for Vodka. Smirnoff Number Twenty-One is the official name of the Vodka although it is known as Red label due to the company colour scheme for different types and distillations. The Russian vodka has a unique triple distillation and filtering process which provides the clear, crisp taste. Given the heritage of the brand (Smirnoff were suppliers to the last Tsars of Russia) this is the standard that all Vodkas aspire to. Where to buy Smirnoff Red Label Vodka ? Smirnoff Red Label Vodka Supermarkets & Stockists. 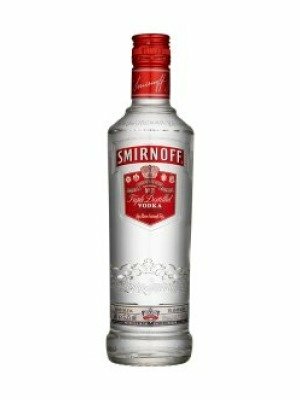 You can buy Smirnoff Red Label Vodka online in most retailers and find it in the Vodka aisle in supermarkets but we found the best deals online for Smirnoff Red Label Vodka in DrinkSupermarket.com, Waitrose Cellar, Tesco Groceries, and others. Compare the current price of Smirnoff Red Label Vodka in 50cl size in the table of offers below. Simply click on the button to order Smirnoff Red Label Vodka online now.